The conflict which involved the United States in Vietnam was not actually a declared war, but was rather a proxy war between the United States, which supported South Vietnam, and the USSR, which supported North Vietnam, during the Cold War era. The fighting took place in Vietnam, Cambodia, and Laos. The French fought in Vietnam from 1950 until 1954. The U.S. had "advisors" in country from the beginning and kept an escalating presence there until the fall of Saigon in 1975. 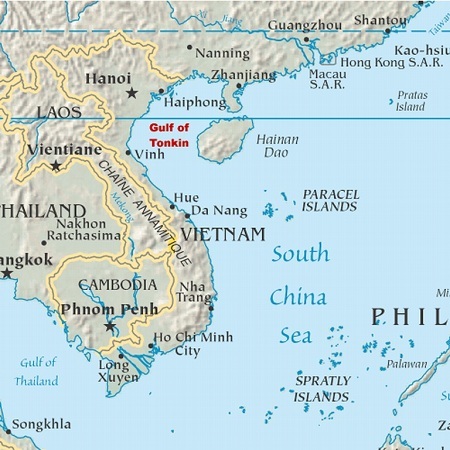 The Gulf of Tonkin Incident was actually not one incident, but the report of two different incidents, both of which were said to have taken place in the Gulf of Tonkin, which is the northern arm of the South China Sea, located off the coast of Vietnam and southern China. Shortly after the assassination of President John F. Kennedy, his former Vice President Lyndon Baines Johnson began to express concerns about what he saw as South Vietnam's inability to defend itself against the Communist North Vietnamese guerrillas who were operating in the country. Johnson and Secretary of Defense Robert McNamara increased military aid to South Vietnam. They also bought fast patrol boats (PTFs), built in Norway, and gave them to South Vietnam. On August 2, 1964, the USS Maddox was performing a signals intelligence patrol when three North Vietnamese Navy torpedo boats approached. Under orders to fire warning shots if any vessel came within 10,000 yards of the Maddox, the gun crews fired, at which time, the North Vietnamese launched a torpedo attack and became engaged in battle with the American ship. Two of the North Vietnamese ships were damaged and the third was dead in the water. President Johnson responded with orders for the missions to continue as he did not want to back away from the challenge. As one can well imagine, August 3 and 4 found those on the USS Maddox hypervigilant. Nothing significant happened while they were on their patrols on the 3rd. But two days later, on the afternoon of August 4, the Maddox reported that it had another "shadow," but that they could not identify whether it was the North Vietnamese, or if it was a ship at all. The original reports by the National Security Agency claimed that a second Tonkin Gulf incident had happened and that another sea battle had taken place, but the report was later amended to indicate that the initial report may have been based on false radar images rather than North Vietnamese boats. In 2005, more than 40 years after the incident, the NSA reports were declassified, and a historical study conducted by that agency showed that the August 2 battle had indeed happened, but the August 4 battle had not. And the report about the evening of August 4 stated "It is not simply that there is a different story as to what happened; it is that no attack happened that night." It goes on to say, "In truth, Hanoi's navy was engaged in nothing that night but the salvage of two of the boats damaged on August 2." From that formerly top secret report: "The incidents, principally the second one of 4 August, led to the approval of the Gulf of Tonkin Resolution by the U.S. Congress which handed President Johnson the carte blanche charter he had wanted for future intervention in Southeast Asia." In fact, regarding the first -- and actual -- incident, the study found that "[a]t 1500G, Captain Herrick ordered Ogier's gun crews to open fire if the boats approached within ten thousand yards. At about 1505G, the Maddox fired three rounds to warn off the communist boats. This initial action was never reported by the Johnson administration, which insisted that the Vietnamese boats fired first." On August 5, 1964, the Washington Post headline read: "American Planes Hit North Vietnam After Second Attack on Our Destroyers; Move Taken to Halt New Aggression." That same day, Johnson ordered retaliatory airstrikes against North Vietnam in a mission called Operation Pierce Arrow. Aircraft from the USS Constellation and the USS Ticonderoga struck oil facilities and attacked more than thirty North Vietnamese ships. Shortly after he ordered the airstrikes, Johnson went on television and addressed the nation regarding the incident. In that speech, he sought to turn American television viewers and radio listeners into allies in his quest to get Congress to give him the power to wage war in southeast Asia. In his famous speech, he said, "As I have repeatedly made clear, the United States intends no rashness, and seeks no wider war. We must make it clear to all that the United States is united in its determination to bring about the end of Communist subversion and aggression in the area." The inaccurate facts about the incident gave birth to the Tonkin Gulf Resolution, which gave virtually unfettered authority to President Johnson in Vietnam. The resolution said that the President was authorized to "take all necessary measures to repel armed attack against the forces of the United States and to prevent further aggression." The Tonkin Gulf Resolution passed 416 to 0 in the House of Representatives and 88 to 2 in the Senate. And thus began the escalation of American involvement in Vietnam, and less than a year later, in July of 1965, the United States had 80,000 troops in South Vietnam, and in 1969, at the peak of the undeclared war in Vietnam, America had 543,000 troops who were dropping approximately 400 tons of bombs and ordnance every day. The third and final section of the Tonkin Gulf Resolution read: "This resolution shall expire when the President shall determine that the peace and security of the area is reasonably assured by international conditions created by action of the United Nations or otherwise, except that it may be terminated earlier by concurrent resolution of the Congress." That date, as it turned out was to be April 30, 1975, more than 10 years after the non-event called "the Gulf of Tonkin Incident," which prompted Congress to give carte blanche to an American President to escalate the undeclared war. In the end, more than 50,000 Americans died in the undeclared war, and there were millions of Vietnamese casualties. Consists of interviews and articles about the Vietnam War from Vietnam Magazine. Also presents book reviews which are relevant to those interested in that war or era and information about Vietnam veterans. Contains more than 250 photographs and slides of and poetry about the war in Vietnam. The photographs, taken between 1963 and 1965, were taken by a soldier from Virginia, range from posed pictures to images of fighting. Locations include the Danang River, Marble Mountain, Nong-Son, Payne Campground, Saigon, China Beach. Features the story of the Gulf of Tonkin Resolution, the background for the resolution, and the results of the passing of it. Also contains audio about the issue. Delves deeply into the Viet Nam war, going back to the battles between Vietnam and France after France was forced to leave the nation. Also diseases the Geneva Peace Accords, the National Liberation Front, the 1961 JFK "White Paper," and the reaction of Americans at home to the war. Time Magazine compiles its features about Vietnam and the leaders of the war, dating back to April 4, 1955. Articles include those about Ngo Dinh Diem, Ho Chi Minh, General Westmoreland, the draft, Robert McNamara, peace protestors, and the Pentagon Papers. Lays out information about the war, including maps of the region, war sites, documents, and glossaries, as well as statistics. Also contains first-hand accounts and recollections. Search for Vietnam War on Google, Bing, or Yahoo!